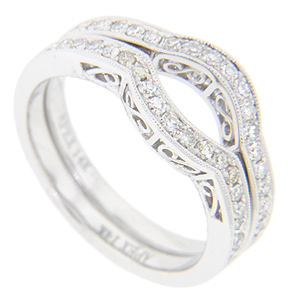 The sides of these 14K white gold curved wedding rings are decorated with looping figure-8 designs. 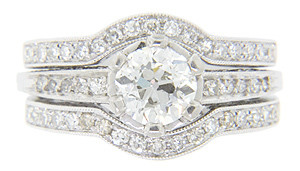 The top of the rings each hold .20 carats of faceted round diamonds. The bands are photographed here with R1289-PL (sold separately). The single band is shown with R2340 (sold separately). 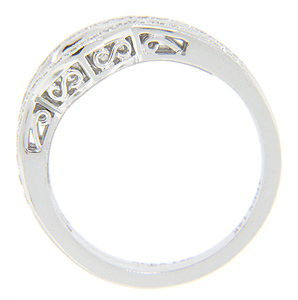 Including the curve, each ring measures 4.2mm in width. Size: 6 1/2. We can re-size. 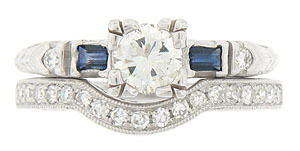 The bands are frequently purchased as a set for $1350.00 but they are also available individually.